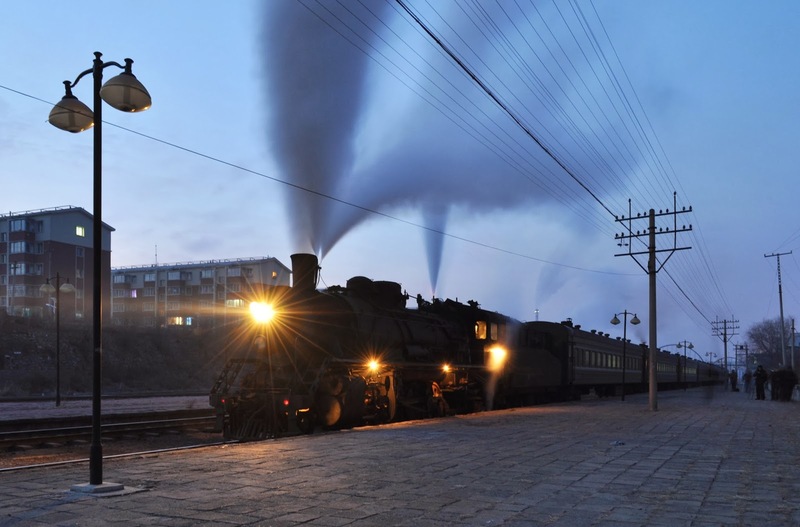 My first Chinese steam locomotive- SY 1772 is pictured at Daiobingshan before sunrise on the 19th January 2014 prior to working the 06:40 passenger to Dongguantun. We had arrived in Daiobingshan the previous evening following an overnight flight from Germany to Shenyang and then a transfer on the minibuses that would become our home for the next week. 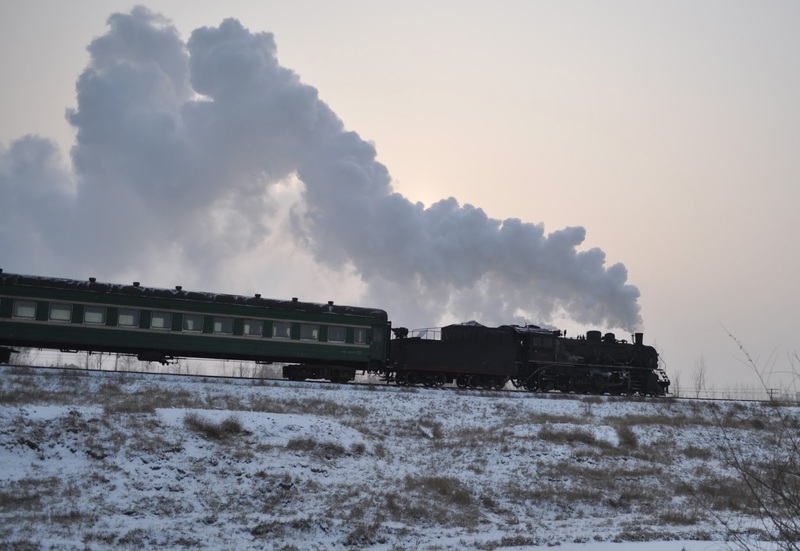 Having watched SY 1772 depart from Daiobingshan we then went on the chase- achieving the first steam sunrise shot of 2014's FarRail 'Winter Steam Spectacle' tour. While steam is still 'real' in Daiobingshan it is filmmakers that now keep steam viable here. There is also a steam keen management who have attempted to set up a museum on the line. One of the 'museum' locos, not usually in normal traffic is KD6 487. We were very lucky to see the loco in traffic having only expected to see SY traction on the line. The KD6 is seen outside the lines depot at Daquin waiting to work a management special. A short while later the KD6 gets its management special moving. As the spoil mound in the background indicates, the real purpose of the Tiefa (Tieling - Faku) railway is to move coal- though these trains are now all worked by diesels. Having worked it's special service to Hanjiagou the KD6 performs a few light engine run-pasts to the delight of the photographers. Unlike the other locomotives we would see on the trip the KD6 is not of Chinese origin- it was built in the USA and shipped to China by the United Nations Relief and Rehabilitation Administration after WWII. 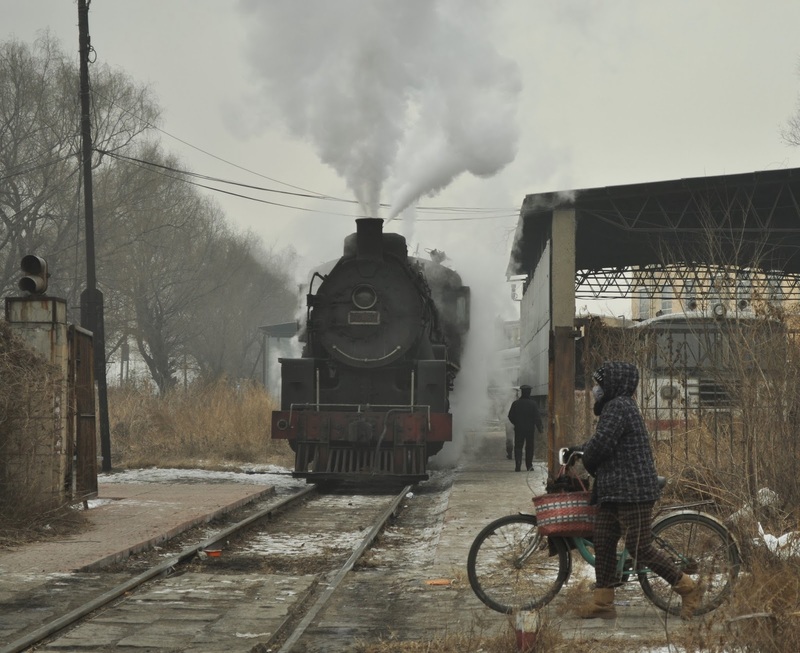 This story also makes the KD6 far older than other locomotives in service in China, dating from the 1940's. 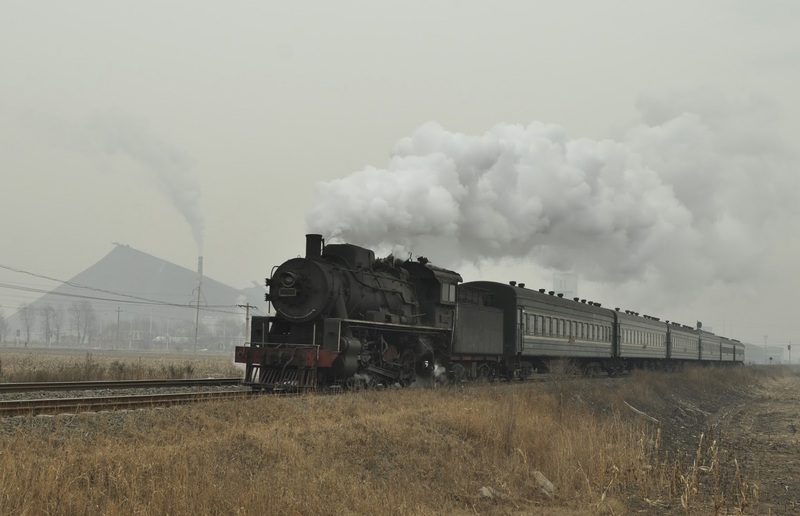 Once KD6 487 finished it's career in the 1990's it was moved to Daiobingshan and became the first steam locomotive in China to be restored. 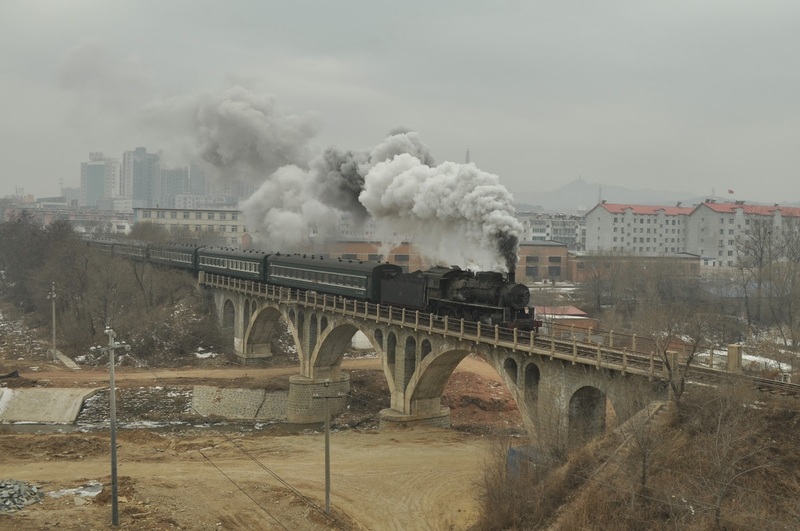 While you could say we were not blessed with the most amazing weather the image of KD6 487 steaming a passenger train across the viaduct in Daiobingshan is no less spectacular. The photograph was taken from the top of a building site! Only in China! By lunch snow had begun to fall and was settling nicely by the time we went out to photograph the afternoon passenger turn to Dongguantun. There used to be an extensive passenger operation run by the Tiefa mining railway to all corners of its network- all worked by steam. Today just two daylight trips continue on the line via Faku- fortunately it is one of the more scenic parts of the system. 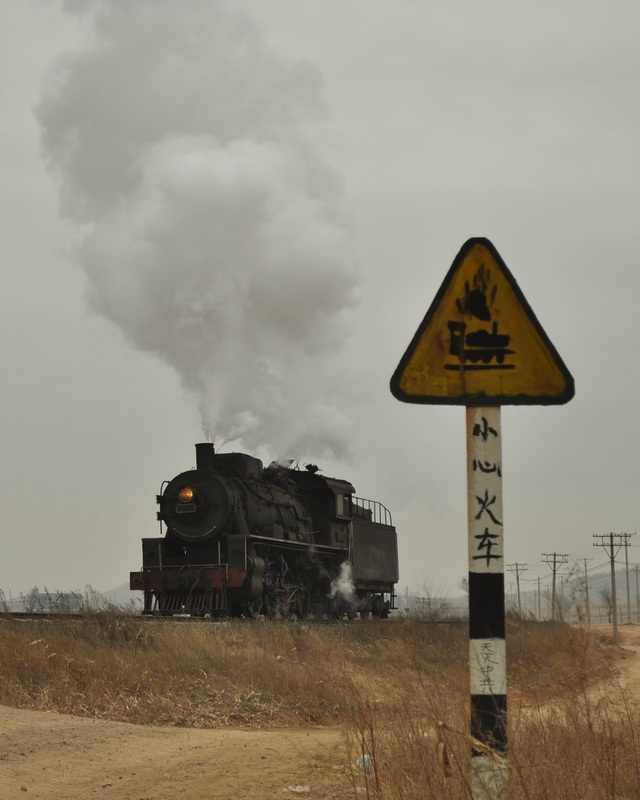 We traveled back from Dongguantun on the steam train for a cost of 20yuan (approximately 20p). By this time light was poor and due to the lack of run-round facilities the loco would haul the train tender first anyway. On arrival back at at Daiobingshan DF4 7754 is seen in the now snowy station with a freight. DF4 and DF5 locos now handle all traffic on the line except the few passenger turns which are worked by steam. The following morning we go out to chase the morning passenger train once again. Today SY 1772 has been turned, so we are able to stay in bed very slightly loner before focusing on it's return journey back to Daiobingshan. On both mornings the weather dawned promising, but failed to materialise. 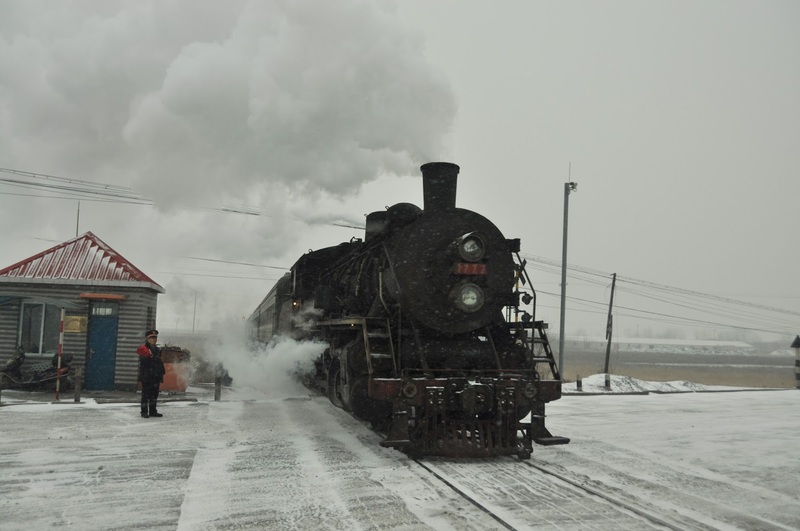 The fresh snow and excellent steam effects in the cold do at least add something to this shot of 1772 heading the passenger back to Daiobingshan. 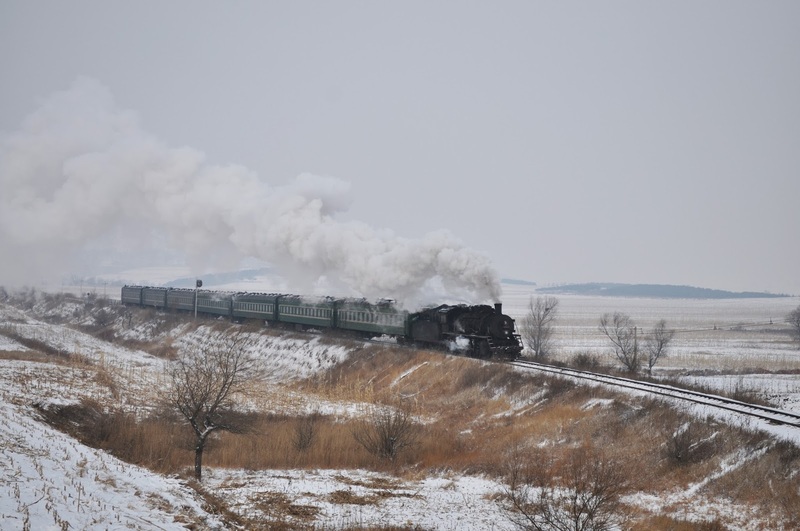 This locomotive is something of a well deserved celebrity- it holds the dubious title of being the last steam locomotive built for non-tourist purposes anywhere in the world. 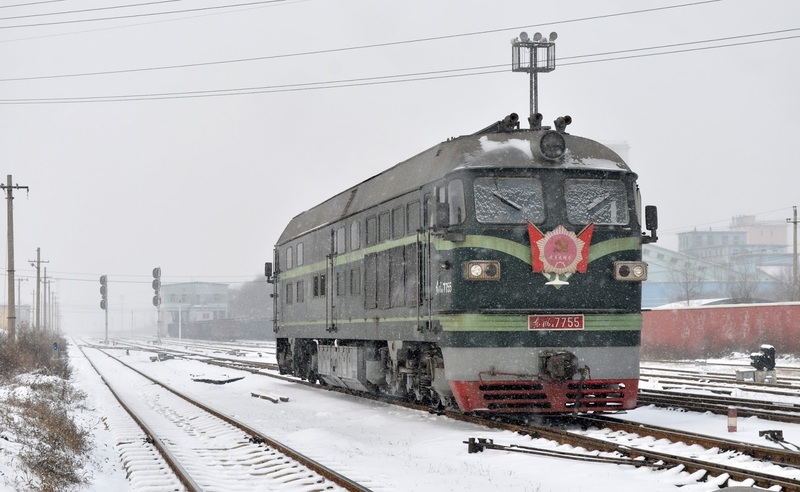 It was rolled out of the workshops in Tangshan as late as October 1999! A visit was made to the depot to watch SY 1772 being coaled between its duties. I got distracted by the big green DF4's which were shunting in the area. Unfortunately I had retired back to the minibus by the time one came through with a loaded train! 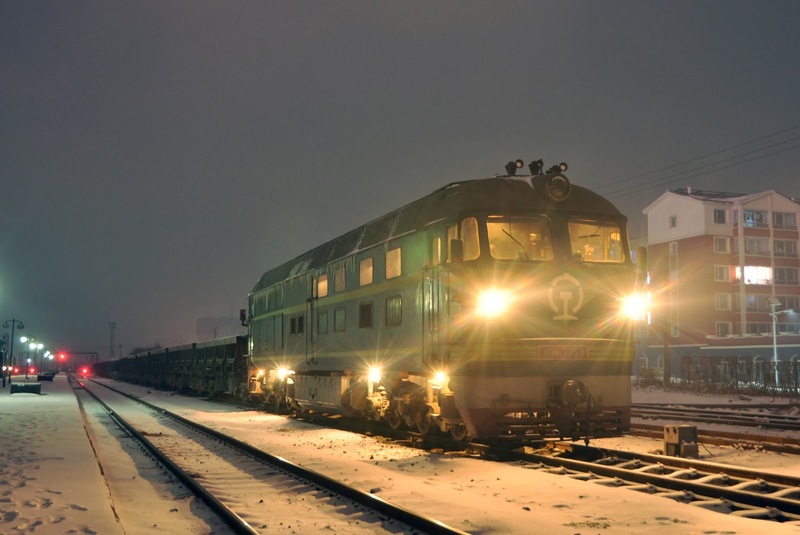 Here DF4 7755 is seen outside the depot at Daqing. Inside the depot is the remainder of the serviceable steam fleet on the railway- the KD6 which we saw the previous day and SY 1770. All three locos had been in operation a week earlier when the railway held a steam festival attracting many Chinese photographers to the line. 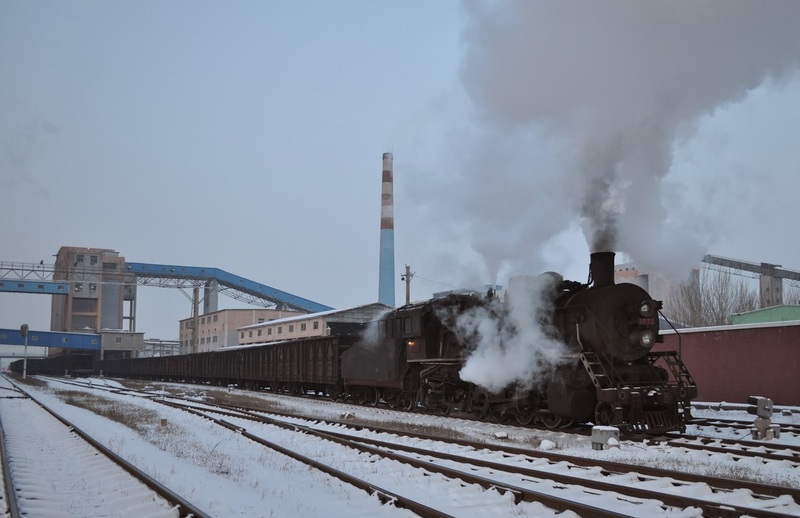 It is not just steam locomotives which inhabit the depot at Daqing. 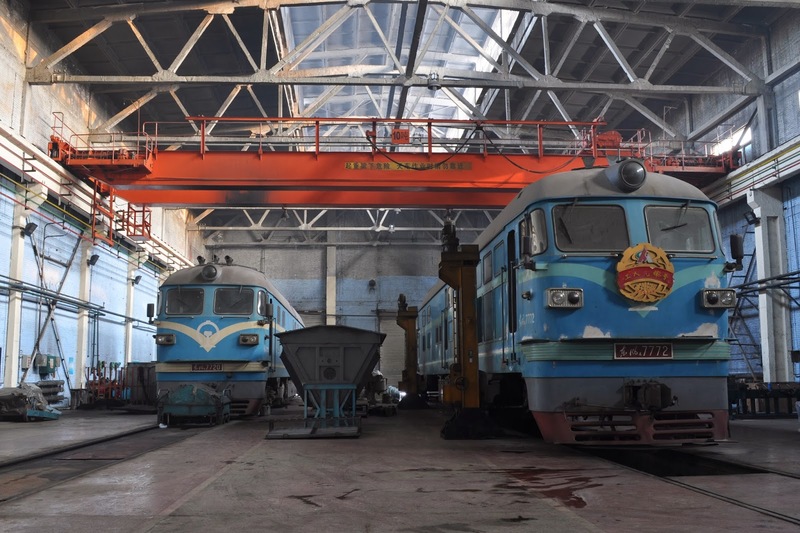 A much larger part of the workshop now services the diesels that work along the line. DF4 locos 7720 and 7772 are seen receiving some extensive maintenance. Steam on freight trains on the Daiobingshan system is very rare in 2014- however the railway decided to run the afternoon passenger service with a diesel due to delays which seemed to be occurring with the steam (I have no idea why!). This enabled the possibility of using SY 1772 to move a set of wagons which had arrived from China Rail down to the loading point at Wangqian. It was touch and go whether the steam would work, or when the wagons would arrive- but we got the call just in time to grab a shot before the light began to fade too far. On arrival at Wangqian the SY was put to use shunting the wagons into their various positions under the loader. The wagons themselves are moved through the loader by pulley once on the right line. 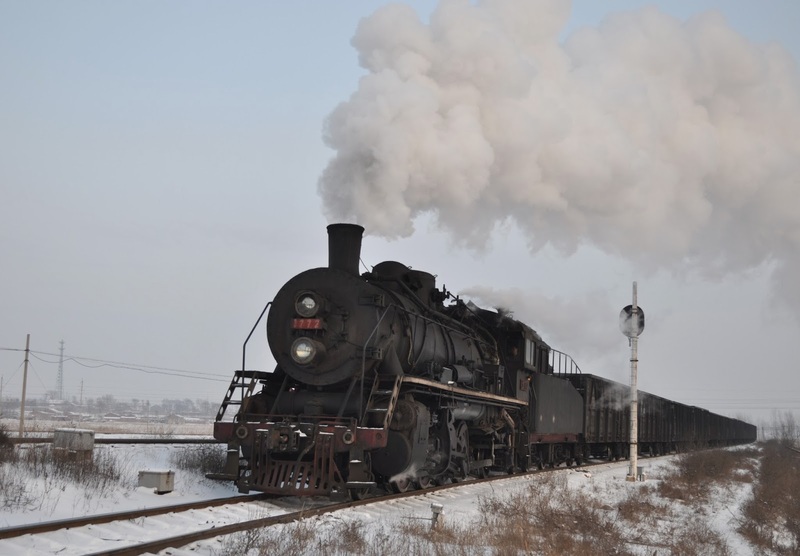 Daiobingshan was a great introduction to steam in China and also provides one of the best chances in the world to travel on a scheduled steam service. How long steam will continue here nobody knows. The railway does take revenue from film contracts which should see some steam retained- however the longevity of the passenger operation must be questionable. I have even seen suggestions that the final passenger train could be withdrawn as soon as road transport is available to replace it.